Santa Barbara’s State Street during Farmer’s Market. Easter morning began with me sipping coffee on the porch next to my host’s pool, watching a hawk sweep over a California canyon lush with spring. When she was ready for church, I rode shotgun, felt the swerves as she skimmed Mission Ridge. Between the million-dollar homes, the Pacific Ocean glittered in the morning sun, the Channel Islands floating misty on the horizon. If this wasn’t paradise, it was the closest I was going to come to it. But then, I think that a lot when I’m out in Santa Barbara. Other people must think it, too: One of the more affluent cities in Southern California, Santa Barbara boasts more than it share of movie stars and other individuals of affluence. But as I was about to be reminded, that’s only one side of life in this seemingly idyllic community. We parked next to the expansive gardens across from the Unitarian Society. While my host’s choir duties required her to sing in two services, it was my privilege as a singing-impaired visitor to only attend one. So while she rushed into the Spanish-style sanctuary, I shouldered my laptop bag and moseyed down State Street to my favorite coffee shop. This was the main drag of up-scale shops and restaurants, galleries and cafes, but this early on an Easter morning, the hustle and bustle of commerce had yet to start. A delicious calm hung over the avenue. Here and there workers hosed the red tile sidewalks that appeared clean enough to start with. A few folks drifted in and out of breakfast joints. Some were dining, some were on their way somewhere – and some were doing neither. Case in a point: A slender, wrinkled man on a bench, his backpack beside him as he listened to a fortyish earth mother of a woman, wearing a flowing skirt, a vest over her white peasant blouse. Long curly hair, no makeup, a lovely kindness to her face. Vaguely hippy-ish. “Yeah, the way I dress, people sometimes I think I’m homeless, but I’m not!” she said, laughing at the thought – and the man on the bench, who apparently was homeless, laughed along with her. 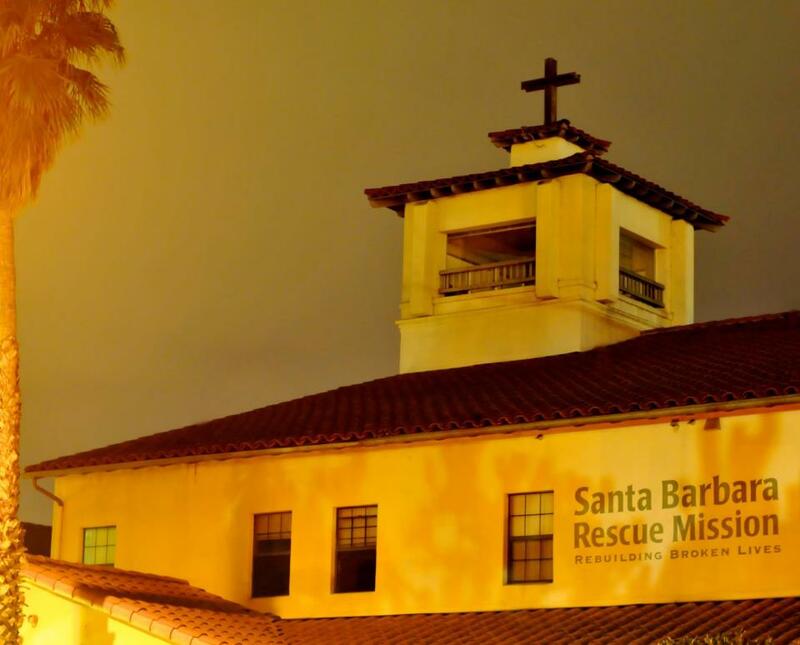 Santa Barbara Rescue Mission, a few blocks from East Beach. As I swept through the rest of a crowded Easter social calendar, I didn’t mention the scene to a single person – nor have I since. But this singularly un-dramatic scene has stuck with me for years, for reasons I still don’t completely understand. Much of my marveling must lie in the matter-of-factness of the woman’s mirth, her utter lack of self-consciousness. She didn’t fumble self-consciously to avoid the topic of the other person’s homelessness; she didn’t ignore the reality both people knew all too well. I would be so worried about saying the wrong thing, I might not speak to him at all –an act probably worse than anything I actually would say. On a deeper level, though, her relaxed dialogue seemed to imply a deeper attitude about homelessness – an utter lack of shame and stigma, of being embarrassed for the person’s economic situation. It suggested someone who has not only suspended the impulse to judge, but had eradicated it entirely. Along with, perhaps, the fear of engaging the homeless: Fear of not only danger, but fear of being asked for more than she could give – or of giving with a sense of futility that a few dollars won’t fix the person’s problems. Setting such obstacles aside, knowingly or unknowingly, she was rising to the challenge set forth by Rev. Sam Wells in one of my previous blog entries – the challenge to set aside our need to solve problems for people (often at a safe distance from said people) and get down to the business of simply being with them, right here, right now. I know, I know. This is a whole lot of philosophizing to project upon a few minutes of overheard conversation, and it probably says less about the person being projected upon than the person doing the projecting. Which is, of course, me. Obviously I feel some of the social awkwardness, with its attached shame and guilt, myself. On a conscious level, I see the lives of people as being formed largely by social circumstance, a complex interplay of determinisms, from family life and biological predispositions to economic class and just plain bad luck. I don’t judge people I see working the street corners. But I also fail to engage them, which risks conveying a kind of judgment, intended or not. This point was clearly addressed two weeks ago, when my Honors 200 students paid a visit to the Homeless Outreach and Advocacy Project at 162 Chandler St. here in Worcester, Massachusetts. There they met with not only HOAP’s extraordinary, dedicated and generous staff, but also clients who had experienced homelessness, in some cases for decades. One client likened himself and others on the streets to being “slugs that hide during the day”, leaving only a trail to suggest their existence. “You have to understand that in our minds, you are the better and we are the worse.” That assumption so governed his daily interactions, only in recent times, since he’s found housing, has he realized to degree to which it shaped his social reality. Published on-line in Mad in America: Science, Psychiatry, and Community, the essay “Lost and Found in Santa Barbara” recounts the story of how Beachy’s son wound up homeless in Santa Barbara, where one day he was killed by the train just off East Beach, not too far from the mission where my friend works. About a year later, the writer journeys from her home in Ohio to Santa Barbara, on what would have been her son Jake’s 29th birthday. she would run into one of her new homeless acquaintances a second time – near the spot where her son had died. What happened next? For that, you’ll have to go to her beautiful and brilliant essay, which deserves to be read directly, unfiltered. I guarantee you’ll find it well worth your time, for both its content and its form. When it comes to ubuntu, well, I’m still working on it. But two women strolling the streets of Santa Barbara have shown me what ubuntu might look like – as have the homeless who returned their gestures in kind. Thanksgiving volunteers at the Rescue Mission. Wouldn’t it be great if Ubuntu became a movement?